Great review. I EDC my 940S-1 unless there is any chance of losing it, then I bust out the 940S. I agree with the lovely “toothiness” of the S90V and no longer obsesively strop this knife in order to maintain that bite. As for the deep carry clip, Benchmade kindly supplies them upon request and they are superior to the OEM clip. I relieve the “stand off”, or “obnoxious clacking” by giving it a good squeeze with an IRWIN Tools QUICK-GRIP clamp until it just sits flush with the scales. Occassionaly I may catch the clip on something and loosen it, so this fix-it works perfectly. Squeeze the clip with the clamp just about at the butterfly until tight again. Thanks for the tip regarding the Contego clip. I’ll have to give that a shot and see if it works for me because, as you say, it is simply a superior choice for this knife. I would be interested in hearing how S90V performs on a serrated blade. I generally prefer plain edge but I’d imagine S90V would do excellent in that configuration. Thanks for the kind words. In a world without the Paramilitary 2 this would probably be my favorite knife. I still have my first Benchmade 940 from August 2005 with 154CM steel. Still works great. I have several others but only use that old one and the new 940-1. Mostly the latter now. I’m also thinking of getting that KnifeWorks exclusive 940-1501 with 20CV & G-10! I’ve never owned an original 940 but I’m sure it’s still a wonderful blade. 154CM is one of my favorite steels, and one that I think has always been slightly underrated. I hadn’t seen this 20CV 940. I’m not crazy about the color scheme but I like G-10 better than aluminum and, at $200, it’s a pretty competitive offering. Interesting point about 154CM. It’s a quality stainless steel like VG-10 and N690. Back in 2005 my top choices for stainless steel were 154CM, VG-10, ATS-34 and N690. They’re still great! When I started with S30V (aka CPM-S30V) it was the super premium stainless steel back then since it was one of the first powdered stainless steels. I have wanted one of these since they were released….but am I the only one that thinks the price is a little crazy? I know it has high-quality cf and s90v, but even the Spyderco positron is $100 cheaper and it has contoured cf. I’m not opposed to paying for a nice knife (I’m reading this site, aren’t I? ), but the value proposition has always seemed off on this one to me. Maybe one of you who has handled it can convince me otherwise. Thanks for the comment. There’s a whole article that could be written about the things that are and aren’t worth paying more for in a knife, and in that article carbon fiber would probably fall on the ‘generally not worth it’ side. I think it makes a difference in the 940-1, just as I think the S90V makes a difference (particularly compared to S30V, which is a steel I don’t like very much at all). And, given the already-high price of a standard 940 (about the price of the Positron), as well as the gradually-lowering price of the 940-1, I would say that it isn’t a huge stretch to say that, in the context of the high-end knife market, the 940-1 is ‘worth’ it. Outside of that context, the price thing is a sticking point for me too. When I originally started thinking about this review, I imagined myself making a bigger deal about it than I ended up doing – and I guess that’s the biggest endorsement I can give the 940-1: it really is a tremendous knife, and while I take philosophical issue with Benchmade’s (and Spyderco’s, and others’) pricing, I don’t regret buying it. Thanks for the response – everyone who has one of these says it’s worth the money, so I think I’m just going to have to actually hold one at some point and my perception will probably change. I said the exact same thing about the Chris Reeve Sebenza until I went nuts one day and splashed out for one. IMHO the quality of these top shelf production blades levels off at about $150, but for those that are really seeking superlative quality, insist upon carrying the best, and can wrap their brains around dropping $300 just for a knife – it is worth it. The difference between my Sebenza and my BM 940S-1 is not as great as the price hike but that extra little attention to detail and ultra-close tolerances do it for me. Mind you, I am not prying off hubcaps with my EDC, but you just have to ask yourself how you are going use and maintain your pocket folder. +1 for the 940-1 being worth the coin. 1. I enjoy your site. Thanks. 2. I don’t get the carbon fiber thing. It seems to me it is better used in larger scale things like fishing rods, tent poles, ski poles, monocoque race cars, where lightweight/resilient strength ratios are important. On a mounted slab like a knife scale, it seems that some synthetic like G-10 is likely to be just as good–dense, tough, waterproof. Carbon fiber lags behind G-10 in all of those things. Sorry… I am done. 3. I almost bought the 940-1 until I handled it and realized that it is lightly built compared to other EDCs I was considering. Light weight is great, even important, but sometimes you have to use the heck out of a blade, and in that light some other knives seemed more desirable. Thanks for the comment and kind words. There is plenty of room for differing opinions here. I also prefer a stouter knife for tougher tasks – it’s all about having the right tool for the job. Nice site and nice review. I’m in a major BM 940-1 buy mode or not to buy…meaning for the past few days when I have free time I’ve been scouring the internet, IG, FB youtube, etc for info and reviews on the 940 and variants including the 940-1. I love it. I want it. While reading your review I was drooling lol. However to the point here is my problem and please please the more that can chime in the better…I own one other Benchmade a Pardue 530BK with same axis lock. Great little knife but what I’ve noticed is that after a month of use there is always a very small amount of side to side blade play. I’ve adjusted and readjusted it and for the past year or so of owning it I’ve learned to deal with either no blade play but an action that is too tight OR slight wiggle in the blade but a nice silky smooth opening and closing, where say when I close it I just have to pull down the axis lock and gently flip the blade closed…this is how it was when brand new. 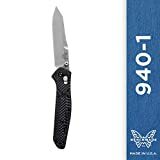 In your review you mentioned a slight side to side wobble…that’s the first time I’ve heard that about the 940/940-1 and I’m worried about having the same problem as the 530. I feel like for the price point of both of these knives there should be absolutely NO blade play. For close to $300 I want a rock solid lockup. Now I’m hoping that my 530 which is very very thin and very very light might just have ultra sensative tolerances hence the blade play after a month of use. I just don’t want the same problem if I were to pull the trigger on the 940-1. Like the author stated it may not affect usage of the knife but unnecessary blade play is a pet peeve that drives me nuts…iv literally adjusted every folder I own from many different companies so that once they’re broken in there is no wiggle yet great smooth action then loctite. The 530 is the only knife I can’t “fix” or get right. So 940 owners chime in and advise me and thanks in advance. BTW I know BM has great customer service so I’m going to send my 530 in and see if they can fix it. My experience with my 940-1 was much the same as you had with your 530. When I first got it, it was pretty tight, although there was still a little play. But over time, and particularly recently after the extended use I put it through during my review, that play became much more noticeable. Tightening the pivot brings it back down to very minor play again. I can tighten it further, to the point that the play vanishes, but, just as you experience with your 530, I lose the super smooth deployment doing so. I have the same issues with my Mini Griptilian. Hopefully some others will chime in too, but I think that it’s the nature of the Axis Lock to exhibit a little side-to-side play, and even if it’s slight, it’s definitely disappointing to see it on a knife that costs so much. If it’s any help I can tell you that even these days, when I’m hyper-critical of the high-end knife market, I still love my 940-1 and don’t miss a single penny I spent on it. I have a number of BenchMade Axis lock knives and most came with a touch of lateral blade play. The trick is to tighten the pivot until it _just_ goes away, but not enough to make the action too tight – and then keep playing with it! Thanks for the tip. I have been kind of avoiding carrying my 940-1 recently because of the bladeplay but now I am inspired to keep breaking it in. Although I do wish that the end user didn’t have to do so much fine-tuning. All of the Taichung, Taiwan Spyderco knives came perfectly tuned and stayed perfectly tuned, and a lot of them cost less than the 940-1. Still a great knife though, and there’s nothing quite as pleasing as a broken-in Axis Lock. Great very enjoyable site, for the blade play, most of phosphor bronze washer system requires break-in period, some take longer some take lesser time depending on manufacturing tolerance. When I first got my 940-1 it was tight, you can just hold down the lock and flick the blade out. You must leave it at this state or if yours come loose (smoother) where you do not feel resistance trying to open it; tight down the pivot under it is “difficult” to open. I left at that and keep on flicking it with lots of wrist action and close it with lots of wrist action and also 2 hand open close until I can feel it loosen up a bit and smoother. I then back out the pivot to a point that it runs super smooth but not free drop when you pull the lock, you have to give it one little shake and the blade drops to past 90 degrees. I left it at that and now we add 2 drops of lube, one on each side of the pivot and proceed to carry and use. In no time it will become a free dropper ultra smooth and dead blade entering. The phosphor bronze washer needs to be squeezed to conform to your blade and break-in, theres no such perfect tolerance of 100% flat surface. You can still do this if you have already lubed it, if you don’t feel like taking apart your knife to clean out the lube, you can simply soak it in laundry detergent soap water for about 30 minutes and rinse it off, take out the pivot screw completely and reinstall it with blue loctite until it is very tight. I would say it should be tight that it will give you blisters after a few open and close, use both hands its easier. If this doesn’t do the trick,.. send it back to Benchmade and have them fix it, chances are the pivot hole is not 90 degree perpendicular or uneven blade tang. Thank you, Henry. You make a good point about allowing the phosphor bronze washers to break in. They are “self lubricating” so as you use the knife they should get smoother and smoother. Excellent points all around. I’m glad I read the review and comments. Like Nick, I’ve been looking at the 940-1 real hard for a couple weeks. It’s a beautiful knife. I love everything about it. I buy all my knives in person from 2 shops. Most times, I pay more but know what I’m getting. At one store near me, the regular 940 is $200. At a different cutlery shop, the 940-1 is $237. This place sometimes has BMs at $20-$30 ish less then internet prices. Sooo, I’m already thinking I’m getting a bargain. I’ve owned/own 2-551s, 2-950s and a 531 (REI edition S30V). All have been great except one 551 with a little blade play (most used). None of them saw much use. I’ve owned many knives and have read countless reviews etc. I think the axis lock has its quirks. -an off centered blade is also very difficult to properly center. -weak detents. Most that I’ve handled were OK but on the weak side. Some were not OK.
A lot of knives end up going back to BM for these problems. BM has excellent customer service from everything I’ve read. But, who wants to send a new knife in to BM.. I really want this knife bad. Chances are it’s going to be fine and I’ll be a happy 940-1 owner. I also had blade play that adjusting the pivot screw did not fix. I sent my 940-1 back to BM, but not only did they correct the blade play (none at all now), at my request they returned the knife with a deep pocket carry clip. This is one great knife! !